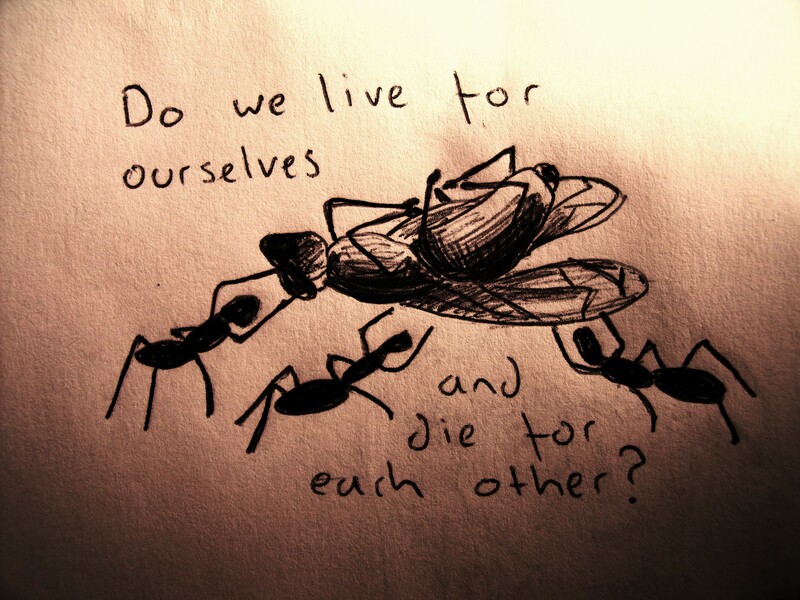 Do we live for ourselves and die for each other? We set up camp at the foot of Mont Thabor. To our east lay Italy and to our west France. Not far from our tent, a rocky chasm, like the gullet of a large beast, swallowed bowls of churning water as the larch trees about our persons swayed in a mellow breeze. The afternoon was warm and our minds placid. With my bare feet cushioned above the short, springy grass, I was surprised to see a bottle fly – metallic-jade and cobalt across its thorax – drop dead from the air. The insect landed close to my toes, on its back and motionless. A minute or two later, a lone ant turned up at the scene, soon joined by an army of a dozen or more. Heaving, lifting and guiding, it wasn’t long before the fly, and indeed the squadron of well-organised ants, disappeared out of sight. Do we – organisms – live for ourselves and die for each other? Love is Life. Then we die. This is so simple yet so powerful. I really love the way you capture your thoughts with the sketches.